More Republicans and Democrats are placing politics at the center of their lives. Both sides seem to believe that a grand solution to our political dysfunction can be found inside politics. If only we could vanquish those evil people waving a different banner, this thinking goes, we’d be on the road to national recovery. But nothing that happens in Washington is going to fix what’s wrong with America. It’s not that our battles over the Supreme Court, over dignity for accuser and accused alike, over issues like taxes and regulation and immigration don’t matter. They matter a lot. The problem is that our ever more ferocious political tribalism and mutual hatred don’t originate in politics, so politics isn’t going to heal them. If too many Americans feel like we’re not “in this together” right now, it’s because we’re not. We are screaming at each other, and the country no longer has enough real social texture to absorb and wick away the hatred. The only way out is to rebuild our communities and launch new ones—one person-to-person relationship and one local institution at a time. I think Sasse is absolutely right in everything he writes in this piece. Each paragraph echoes an Epsilon Theory note or two that I’ve written, most loudly The Arborist and Sheep Logic and Clever Hans and The Icarus Moment, most recently Things Fall Apart (Part 1). Sasse’s conclusion, that the way to rebuild our political culture must be a bottom-up, non-political movement rather than a top-down, party-driven campaign, is the backbone of what I’ll be writing about in the concluding note of Things Fall Apart. I also think Sasse is losing the Game of You, meaning that he is losing his identity and authenticity as he tries to salvage a political career. Why? Because you can’t do what Sasse says you should do from inside the belly of the beast. You can’t build a non-political grassroots movement as a sitting US Senator and a card-carrying member of the Republican party. You can’t practice what you preach. 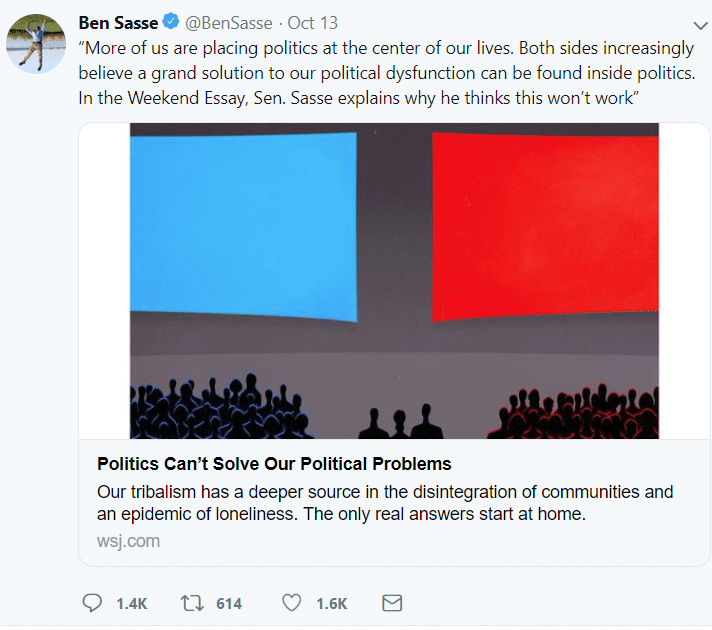 Sasse has created a cartoon of himself as someone outside the political World-As-It-Is, someone who writes entire books on community and non-political coming togetherness. But at the same time, he is living a life of intense immersion within the political World-As-It-Is, someone who wages actual political campaigns and casts actual votes for partisan policies. The Sasse cartoon does not match the Sasse life. As a result, we have no idea who Ben Sasse IS. As a result, Ben Sasse is perceived as an inauthentic shill by Democrats and as an inauthentic scold by Republicans. As a result, as Margaret Thatcher famously said, he is standing in the middle of the road and being run over by traffic from both sides. As the kids say, I’m just here for the ratio. Dig into the comments on this tweet or the comments on the WSJ piece itself, and two facts immediately pop out. First, there is very little engagement from potential book buyers here. I mean, 614 retweets? Only 1.6k likes? I don’t know who’s publishing Sasse’s new book, but they’ve gotta be extremely nervous right now. Second, the comments themselves are FAR more likely to slam Sasse than to support him, from BOTH sides of our political divide. To use the language of A Game of You, Sasse’s timeline is dominated by rage engagements, not mirror engagements. Again, that’s a huge problem for a politician trying to sell books. To be clear, I’m not saying that Ben Sasse is an inauthentic human being, either as a shill or as a scold. In fact, if I were a betting man (and I am), I would place a significant wager that he is, in fact, a VERY authentic guy. I don’t think it’s possible to write the books that he’s written and to live the life that he’s lived with his family without being an authentic person whose core identity is in-line with what he wrote in this WSJ opinion piece. I really don’t. What I’m saying is that Ben Sasse’s chosen career – professional politician – is no longer sustainable or compatible with his professed identity. It used to be highly compatible. Whether as shtick or strategy or True Belief, beautiful speeches about coming together as Purple Americans used to be the surefire avenue for the Presidency. Used to be. But as I wrote in Things Fall Apart (Part 1), if you’re an incumbent centrist politician today, Republican or Democrat, you have exactly two choices. You remain silent and just go with the party flow, clinging on for dear life against primary challengers, holding your nose at the party excesses, apologizing to your donors and your spouse in private, and hoping that one day the party comes back to you. You tell yourself “apres moi, le deluge.” Or in English, “sweet Jesus, have you seen the racist moron / lunatic communist who would take my place if I quit?”, and you’ve got a big enough ego to believe that sort of excuse as you slowly sell your soul. That’s it. Those are your options. Paul Ryan took Door #2. So did Jeff Flake. So did Bob Corker. I think it is simply timing. Establishment Republicans are finally seeing the fallout of the splintering of the party that began eight years ago with the Tea Party and reached a crescendo with the nomination and election of someone like Trump in 2016. Whats going on right now in the Democratic Party (Bernie Sanders, Elizabeth Warren, Alexandria Ocasio-Cortez) feels very similar, just several years behind. I fully expect that a “progressive” (lunatic communist?) grabs the Democratic nomination in 2020 and the moderate Democrats will start dropping like flies as well. Agree entirely with Rob H.
Thank you ⇧ and Ben ⇩ – makes sense. Is there a difference between “politics can’t save our political problems” versus “the political process can’t save our political problems” versus “we, as humans, can’t save our political problems”? Seems to be a play on words but I have faith that there’s a solution out there. I have a small biased inkling that our ET Pack will become a part of that solution.